Sts. Peter and Andrew probably would have caught their limit on East Tennessee’s Hiwassee River the weekend of July 21. Father David Boettner and Robb Morris would have seen to that. With a supply of flies and access to a fly-tying kit, the apostles would have been fishers of trout … and men. 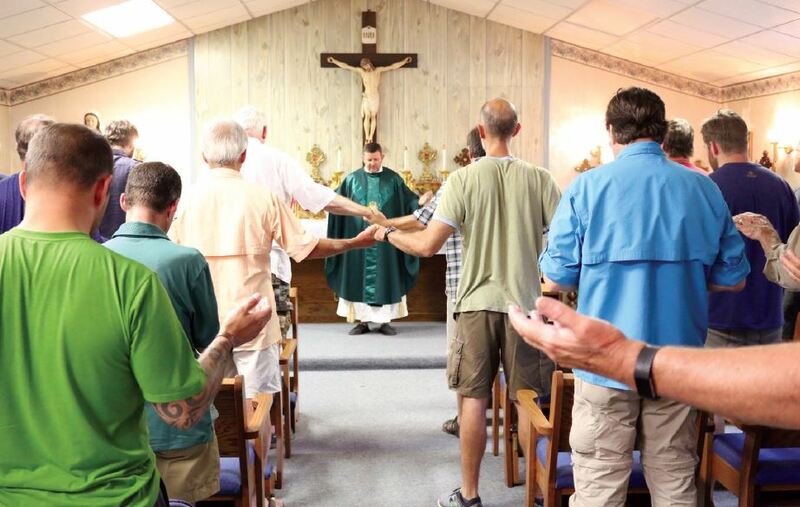 They would have been right at home at Christ Prince of Peace Retreat Center with Father Boettner, Mr. Morris, and more than 30 other men who had gathered to share — and grow — their faith. It was the second annual Fly Fishers of Men Retreat, and fish they did. The Cathedral of the Most Sacred Heart of Jesus rector took a page right out of Jesus’ handbook: find men interested in fishing and encourage them to follow Him and evangelize the masses in His name. It worked for Peter and Andrew. 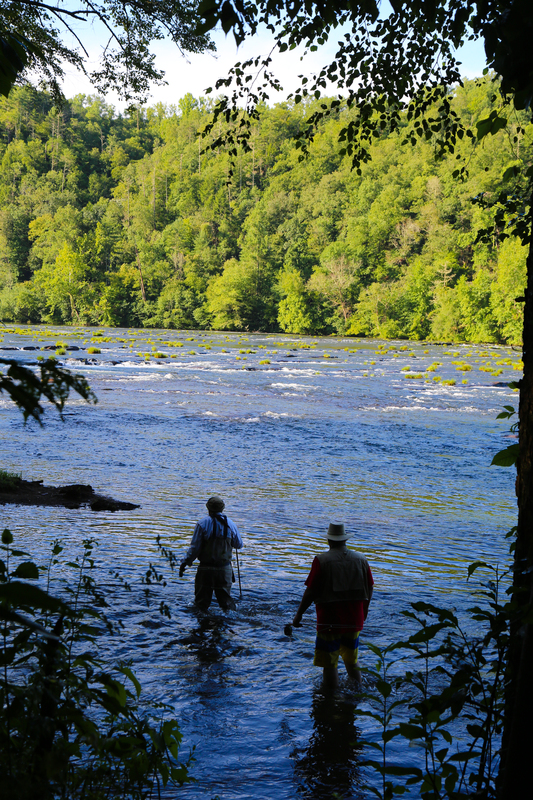 So, for the second consecutive summer, the Hiwassee River in Benton was the perfect backdrop for the Fly Fishers of Men Retreat, where fellowship and prayer converged with trout fishing to give life to Jesus’ teachings. Mr. Morris said the retreat is an excellent evangelization tool. So much so, in fact, that participants are discussing keeping the group together throughout the year to continue Bible study and possibly introduce community service projects. A third Fly Fishers of Men Retreat next summer is practically a foregone conclusion. Father Boettner believes it’s important for spiritual growth for an individual to join with others to share common faith interests and experiences. This is especially relevant for lay men, who tend to choose work over faith-based or social groups. “Women probably are better at being social with other women, and they seem to form groups of women more naturally and easily. Men, because they spend so much of their lives on the job, and maybe culturally they are more geared toward defining themselves by their work, they tend to be more limited by their work zones,” Father Boettner said. “Outside of that, it is usually their wives who introduce them into friend groups or other groups because of their children. It’s important for men to have a place where they can encourage each other in faith because study after study shows the vital role fathers play in the development of their children’s spiritual lives. “And if the father is absent or neutral about faith, that really doesn’t help that child to grow deep in faith. So for men to be intentional about their faith and to be active practitioners of their faith is really important,” he noted. Father Boettner and Mr. Morris pointed out that several of the retreat participants said their wives introduced them to the getaway and were apparently very encouraging. “It was funny because many of the wives of the guys that were on the retreat saw the bulletin announcement and said to their husbands, ‘You know, you should do this.’ The guys would then say, ‘My wife is asking me to go fly fishing for the weekend. Why would I say no?’ Father Boettner said. While fishing on one of the best trout rivers in North America was an influential feature for the weekend, fellowship and spiritual nourishment was the focal point. The retreat location is somewhat secluded. There is modern lodging, a kitchen, bathrooms, and — most importantly — two chapels and God’s miraculous landscape amid the Appalachian range, with the Hiwassee flowing by. Father Boettner believes it’s a perfect setting for reflecting on one’s faith. “Being on the river, you really are without distraction. Fly fishing requires you to be singularly focused on what’s in front of you so you can catch that fish. There are so many metaphors that come out of it that allow you to calm down inside and take away a lot of the distraction,” the cathedral rector said. “And the setting along the Hiwassee River in the Hiwassee River Valley is gorgeous and inspiring. I think it touches something in your soul. Beauty always leads us back to God. It’s one of the transcendentals that reminds us of the beauty of God and almost transports us to God. When you see something that captivates you, you can’t help but start to think about the Creator of this … who created this beauty for us and what a great God it is who loves us so much that He surrounds us with this beauty,” he added. Mr. Morris is also a believer. After working with Father Boettner for some time to make the first Fly Fishers of Men Retreat a reality, he organized the second one with much anticipation. “The retreat center is a perfect location, especially with expanded lodging. 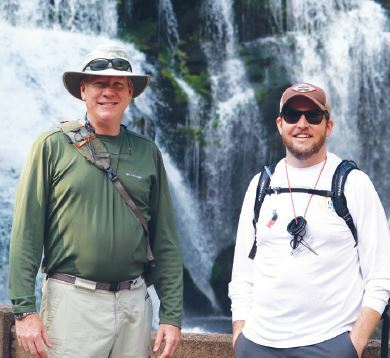 And the Hiwassee is one of the nicest trout streams this side of the Mississippi,” Mr. Morris said, noting that recent additions and upgrades at the retreat center now provide residential quarters that can sleep 15 people each. The fishing part comes naturally to Mr. Morris. It’s his pastime. 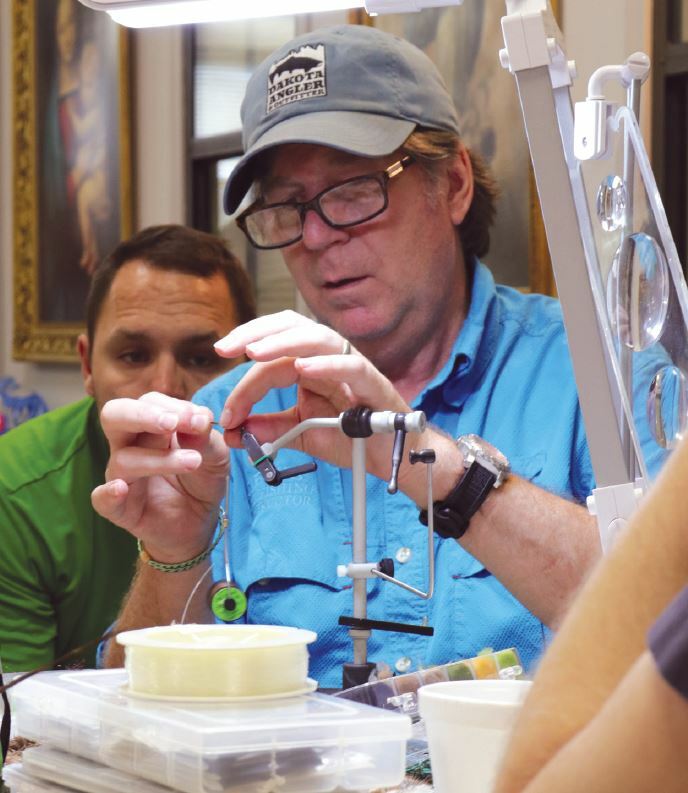 In fact, he offers tips to the participants in everything fly fishing — from equipment and casting technique to the intricate skill of tying flies. However, fishing experience is not a prerequisite. 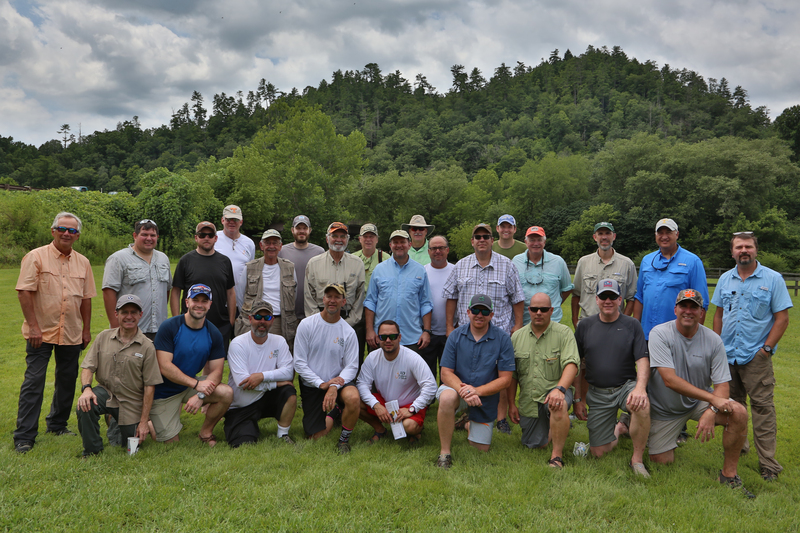 In fact, half of the July participants were fly-fishing novices. Mr. Morris stressed that everyone is welcome, regardless of fishing (or faith) experience. 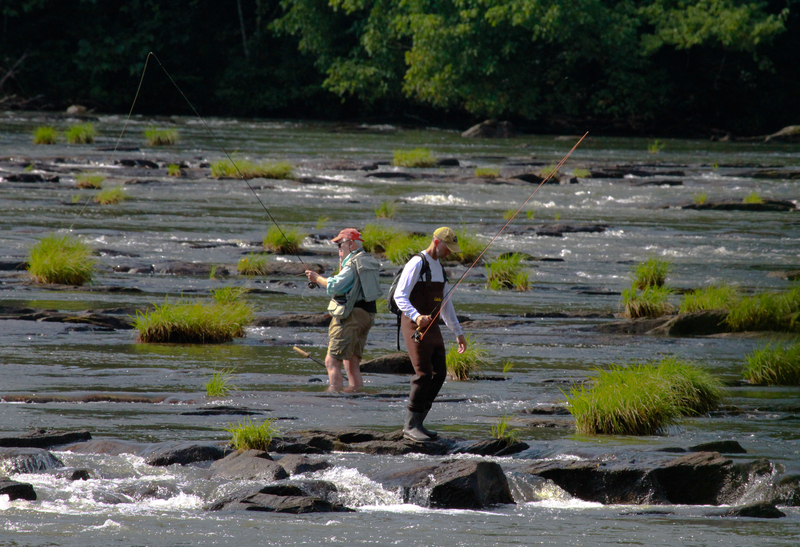 Fly fishing isn’t the main reason he takes part in the retreat — not by a long cast. 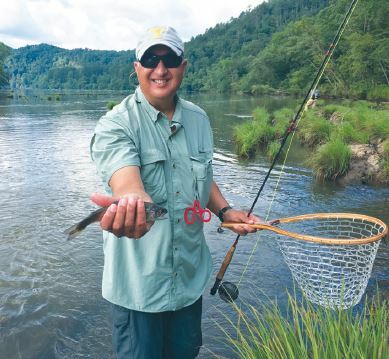 “I get satisfaction from teaching people to fly fish. It is such a great sport. But I’ve benefited so much from being with other men in Bible study and fellowship. 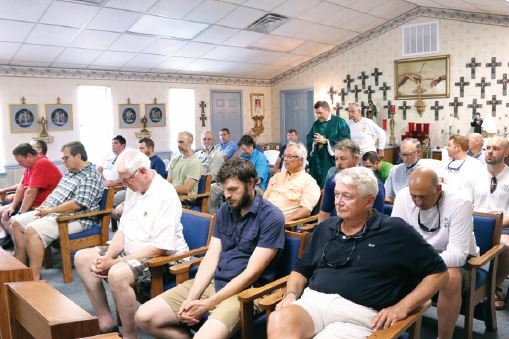 This retreat is a great evangelization tool,” he said, noting that two men from the Diocese of Birmingham, Ala., heard about the retreat by word of mouth and asked to attend. “Our retreat is open to any men in the Diocese of Knoxville and even outside the diocese. You don’t even have to be Catholic to take part,” Mr. Morris added. Father Boettner led Mass for the men on retreat and discussed Jesus’ teachings on the importance shepherding plays, not only in faith, but in the everyday life of a Christian man. In delivering his homily, the Sacred Heart priest said it was fitting that the first reading and the Gospel for the weekend Masses meshed with much of what the men shared in Bible study. “We’ve spent a little bit of time looking at how we participate in that shepherding role, how God calls us to be shepherds in our communities and in our families. But we see in the first reading how the shepherds failed. And God says, ‘I myself will shepherd them.’ Then we see again in the Gospel where Jesus sees people who are exhausted. They’ve just worn themselves out. They’ve tried everything with their own strength, and it hasn’t been enough. They’ve worked hard; they’ve followed after Jesus, but they’ve relied on themselves. When Jesus sees that, His heart is moved with pity because He really does want to make it easy for us. He wants to make our lives joy-filled. He wants His joy to be ours and our joy to be full,” Father Boettner preached. “As a good shepherd, He reaches out to them, and He begins to teach them. It’s that role of Jesus as the Good Shepherd teaching us as well. Sometimes when we feel overwhelmed by the responsibilities that we have, because each of you has tremendous responsibilities, when you feel overwhelmed in that, remember that you, too, have a shepherd. Not only are you a shepherd, but you yourselves have a shepherd — the Good Shepherd. His heart is moved with compassion for each of us because He wants what is truly good for us. He wants us to know that we are loved. He wants us to experience that gift of unconditional love so that we, in turn, can give that gift back to people we love,” he concluded.